As announced earlier this year, KeePassRPC is a remote access interface plugin for KeePass Password Safe 2. This post is aimed at application developers; it outlines how you could use the plugin to enhance your user’s KeePass experience and references the latest version of the source code (0.8.5). There is currently no official release but you can see version 0.8.4 in use with KeeFox 0.8.4 and view the source code for 0.8.5 in the KeeFox SVN repository. The RPC system is an implementation of JSON-RPC - this is a simple protocol and probably does not support every possible desired feature but clients are easy to implement and existing implementations exist for most programming languages already, so you don’t need to be a .NET C# expert to work with this plugin. In fact, you don’t even need to be able to compile the C# source code to get started provided you’re happy to wait until the next experimental release of KeeFox. Either way, you will need to contact me to “register” the name of your client application and users will then require the latest version of the KeePassRPC plugin in order to use your client application - more details of this process are at the end of this post. 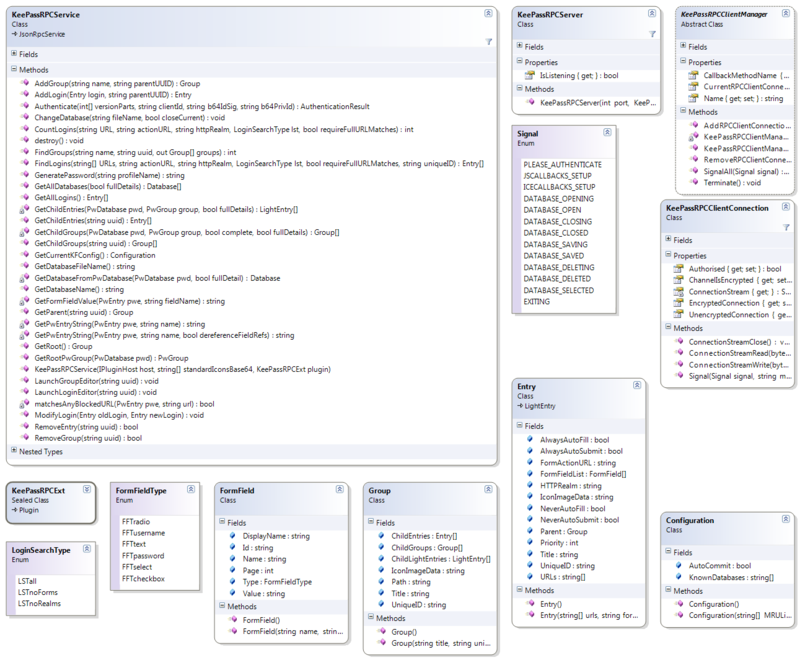 The image below (click to see a larger version) shows some of the more important areas of the plugin architecture. The most relevant to anyone interested in calling the API is the KeePassRPCService class; most of the listed methods can be called by sending JSON-RPC requests to the RPC server. Many calls to the API will require or return Entry or Group objects. I’ll leave the detail of how to authenticate and some examples until a later post but please get in touch if you’re interested. The API will experience very few changes over the next few months because I need it to remain stable in order to ensure that version 1.0 of KeeFox can be released with well-tested components. As the release of KeeFox version 1.0 approaches, I intend to branch the development of KeePassRPC so that an improved version 2 API can be produced, hopefully with input from other developers interested in communicating with KeePass Password Safe. If requested, I would be able to produce this branch fairly soon. Version 2 is not currently under development but I hope it would include the features below. Extension system (probably through the use of additional KeePass PLGX plugins?). This will allow anyone to add support for new RPC clients without my involvement and will likely involve also adding support for a less KeeFox focussed entry/group window tab(s). Upgrade hash generation function from SHA128 to SHA256 for “future-proofed” security.